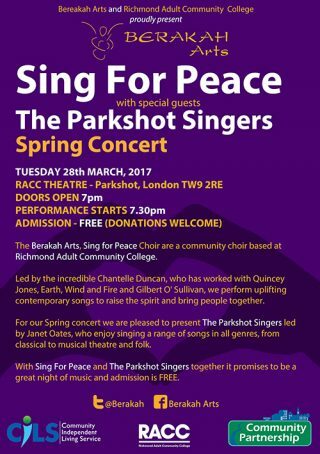 The Sing for Peace Choir end the Spring term at Richmond Adult Community College with a special concert this time with guests – The Parkshot Singers! Led by Janet Oates TPS are another choir based at RACC and we’re very grateful for the support from RACC and the opportunity to sing that we have as a result of being part of the college community. As part of the community remit of the SFP Choir since last summer we’ve been singing once a month at a dinner held by the local Alzheimer’s Society for sufferers of Alzheimers and their carers. It’s a heartwarming night and the choir love being involved because it’s plain to see how the music brings smiles to the faces of all the people at the event. After our performance we help to lead the guests in a sing along of songs chosen by them. It’s a truly rewarding night for the choir members who give up their night to come and it means that Berakah is helping people at the heart of the community, using music to help make them happy. It’s that time of year again! 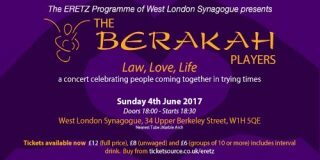 Come and join our Sing for Peace Choir and the Berakah Players for a concert at Richmond Adult Community Concert, to see in the season. 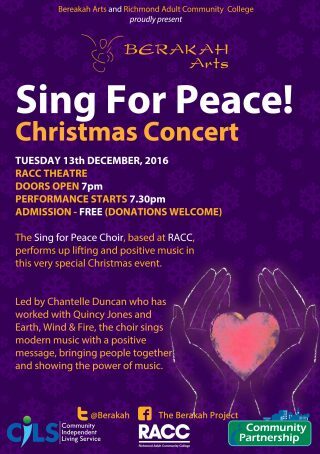 TUESDAY 13th DECEMBER, 2016 RACC THEATRE DOORS OPEN 7pm PERFORMANCE STARTS 7.30pm ADMISSION – FREE (DONATIONS WELCOME) The Sing for Peace Choir, based at RACC, performs up lifting and positive music in this very special Christmas event. Led by Chantelle Duncan who has worked with Quincy Jones and Earth, Wind & Fire, the choir sings modern music with a positive message, bringing people together and showing the power of music.